This particular Monday is a big day for Fortnite lovers as the game hits iPhone and iPad, but what else happened in gaming news? See for yourself. Everyone knows to stay away from news on April 1st, lest they get their hearts broken by an hoax announcement they thought was real. That said, these pranks are fun to peruse after the fact. Our friends at PC Gamer put together a comprehensive April Fools roundup from the gaming world; highlights include a battle royale mode in Path of Exile and a For Honor duel between two sword-swinging buffalo. Lugia is leaving Pokemon Go again as of today, but two airborne legendary Pokemon are taking its place starting now. You have until June 5 to catch them; here are all the instructions you need on how to add them to your collection. If you were keen on playing this bizarre (but unique! ), 4v4 sports brawler starring mythological heroes, I have some bad news. 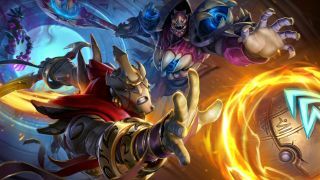 After going back to the tank on the core design, Amazon Game Studios has opted to stop development on its debut game Breakaway altogether. There go our hoop dreams of slam-dunking a golden orb for the game-winning point. Speaking of game projects dying a quiet death, Valve has seemingly moved on from Steam Machines and its push to get PCs in your living room. The Steam Machine section is no longer listed on Steam itself, indicating that the Steam Machine dream is dead. Hopefully you didn't go all-in on a full set of Steam Controllers. If you're a Twitch Prime member - which is pretty common, considering all you need is an Amazon Prime subscription - you'd do well to check out the five free games (pictured above) you can collect between now and the end of April, as well as a Heroes of the Storm chest with a guaranteed Legendary item. You can see a full list of the bonuses here, and I highly recommend playing SteamWorld Dig 2 and Tales from the Borderlands ASAP. God of War director on the game's length and magnitude: "What have we done?"